This morning, a group from SEEDS was invited to Orgaworld’s compost facilities. For me, this is a dream come true! I am a huge supporter of composting and it was so great to be able to see how a full scale facility worked. 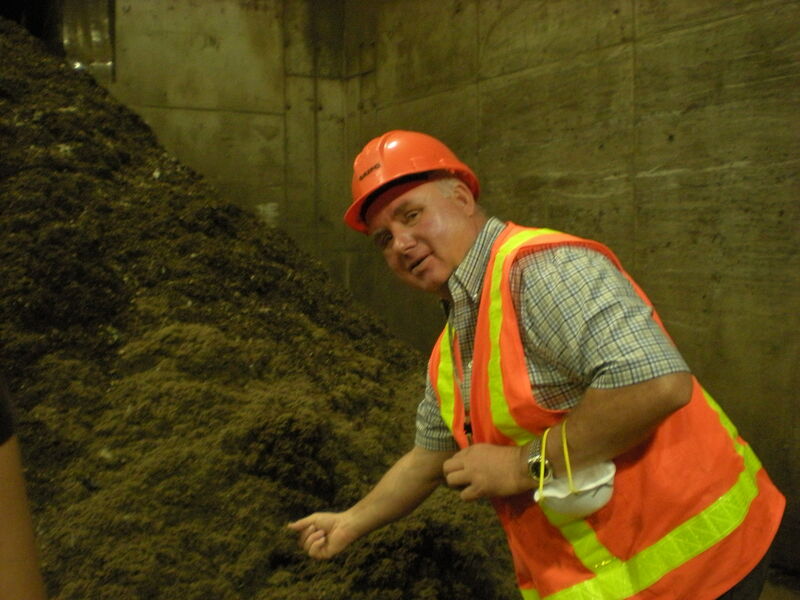 Orgaworld processes the organic waste that is collected as part of Ottawa’s Green Bin Program. So, for those of you who weren’t able to come today, let me step you through some of the highlights. 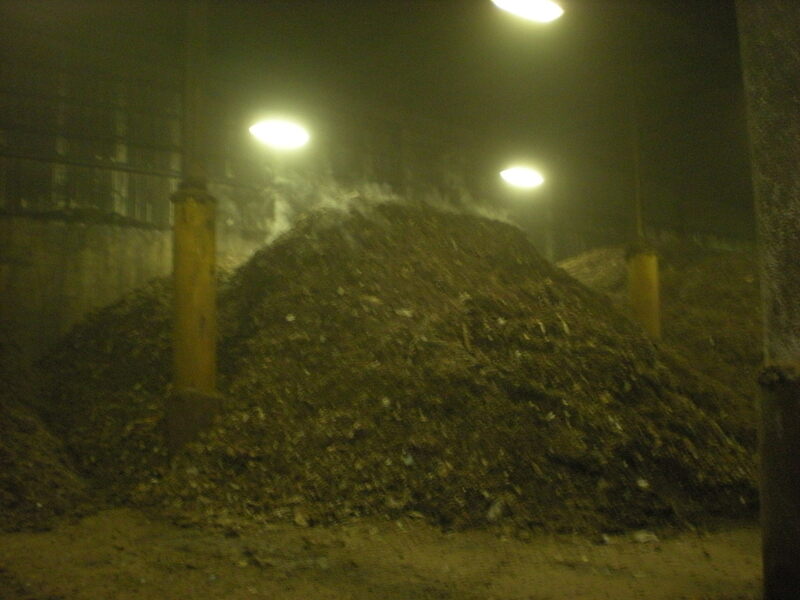 When organics arrive, they are shredded and piled in big piles, just like the picture above. The immature compost is then placed in large tunnels… but it was hard to take a picture of that. The tunnels are equipped with air spigot on the floor and water sprayers in the ceiling. When the compost comes out of the tunnels, it is screened. In the above photo we are getting some of the inside scoop from our wonderful tour guide. 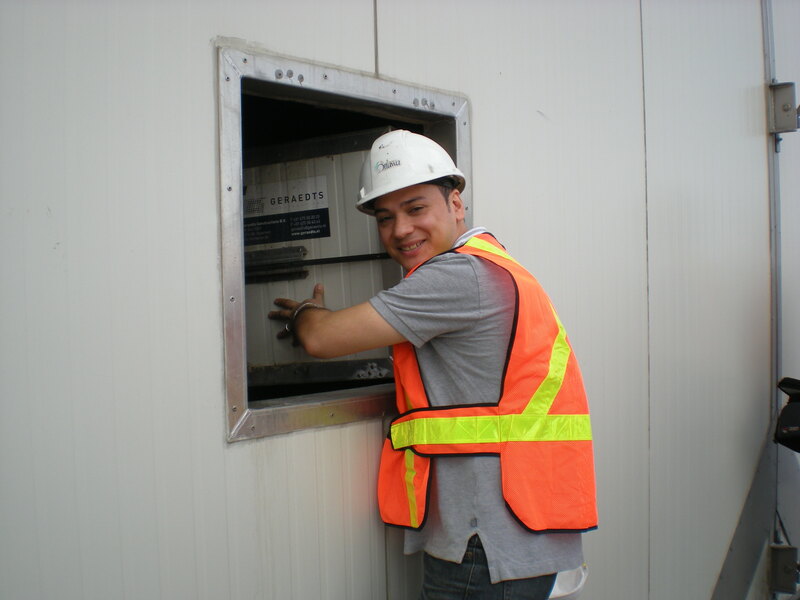 All air from Orgaworld’s facilities is filtered through a biofilter. In this picture (above), Bahman is checking out the biofilter, which is basically a pile of hardwood. Here is a pile of the final product. It’s nice and fluffy and has a nice earthy smell… and Kennedy agrees! Thanks again to Orgaworld again for the lovely visit and for the fine people at the A&WMA for making it happen for us. If you want to see more photos, check out of Flickr stream! 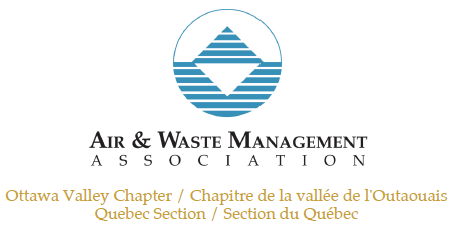 The Ottawa Valley Chapter of the Air and Waste Management Association (A&WMA) will hold a breakfast seminar on Wednesday, March 7th, 2012 at 7:45 a.m at the Metropolitain Brasserie. Guest speaker Laurence Blanford director of the Partnerships Division, Climate Change International, Environment Canada will present “Climate Change – An International Perspective”. Laurence is responsible for multilateral climate change engagement and overseeing Canada’s international climate change assistance and will provide an overview of howCanada remains an active and constructive player in the international climate change negotiations and will continue to work with its international partners to achieve a fair, effective and comprehensive global climate change regime. The presentation will also discuss the current state of play in international climate change cooperation and Canada’s international engagement in the area. There will be a full breakfast and as usual, there will also be an opportunity to network with colleagues. Please see the invitation (available by clicking here) for further details. The Metropolitain Brasserie is located at Sussex and Rideau. Advanced registration is $25 for A&WMA members and $30 for non-members. Students pay $10 if they are members or $15 if they are non-members. We encourage online registration before March 5th, 2012, as it helps us to arrange the venue and anticipate the number of attendees. Alternatively, you can RSVP for the event withGeneviève Thouin at genevieve.thouin@ensta.org. We will also accept payment at the door can be by VISA, Master Card, cash or cheque for those who RSVP. The Ottawa Valley Chapter of the Air and Waste Management Association (A&WMA) will be combining their upcoming AGM with a breakfast seminar event at the Metropolitain Brasserie on Tuesday, December 13, 2011. Guest speaker Bill Wong from SAIC Canada, will present “Innovation in Renewable Technologies and Applications” at the breakfast seminar starting at 7:45 am. Bill will discuss new opportunities and barriers for renewable energy integration into our built-environment and present some of the more innovative renewable projects from communities across Canada. The breakfast seminar will include a full served breakfast, a question and answer period and an opportunity to network with colleagues. The Metropolitain Brasserie is located at Sussex and Rideau. Advanced registration is $25 for A&WMA members and $30 for non-members. Students pay $10 if they are members or $15 if they are non-members. We encourage online registration before December 11th, 2011, as it helps us to arrange the venue and anticipate the number of attendees. Payment online by VISA or Master Card can be made via our secure online payment site through our website. Alternatively, you can RSVP for the event with Seton Stiebert at seton@stiebertconsulting.com. Payment at the door can be by VISA, Master Card, cash or cheque. Immediately following the breakfast seminar at 9:00 am the Ottawa Valley Chapter (OVC) will be holding their Annual General Meeting. All A&WMA members are encouraged to attend and we also welcome any non-members to stay on and learn more about the chapter. All members are eligible to vote for and stand for positions on the OVC 2012 Board of Directors. If you are interested in being nominated for the board of directors you can contact the chair at seton@stiebertconsulting.com. The draft agenda for the event and minutes from the 2010 AGM are available here. As space is limited, we may have to limit participation of Non-members and students. 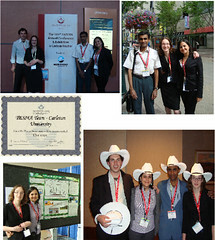 SEEDS Carleton, with the support of the Ottawa Valley Chapter (OVC) of the A&WMA, would like to give 4 students a chance compete once again in the Environmental Challenge International, or ECi, presented as part of A&WMA’s annual conference and exhibition (ACE 2011) in Orlando, Florida from June 20-24, 2011. ECi 2011 is a great opportunity to present your solution to industry professionals, to network and most importantly, to have a chance at the price money! To help you prepare your submission, SEEDS will be holding a one-day workshop on Saturday May 14th beginning at 9:30 a.m. in ME 3444 where students will be able to talk to local experts, to form groups of 4 and begin working on their 5-page (max) proposals. Local experts and professionals will be available from 10:00 a.m. to 12:00 p.m. (noon) to discuss with students and point them in the right direction. Students have until 4:00 p.m. to work in the boardroom. By Monday, May 16th at 9:00 a.m. each group must submit a 5-page (max) proposal of their solution to info@seedsottawa.ca. The solutions will be judged by the A&WMA experts and the the winning team will be awarded a chance to compete in the ECi in Orlando. The winning team will have until May 28 to further develop their proposal and submit it to the competition organizers. A poster and presentation must be prepared for the conference itself. Come prepared with your ideas and enthusiasm! Only student members of the OVC-A&WMA are eligible to participate however, if you are not a member you can join on Saturday May 14 for a reduced membership price of $10. Lunch will be provided by SEEDS. Workshop Time: 9:30 a.m. to 4:00 p.m.
RSVP by clicking here or accept the Facebook invitation here. 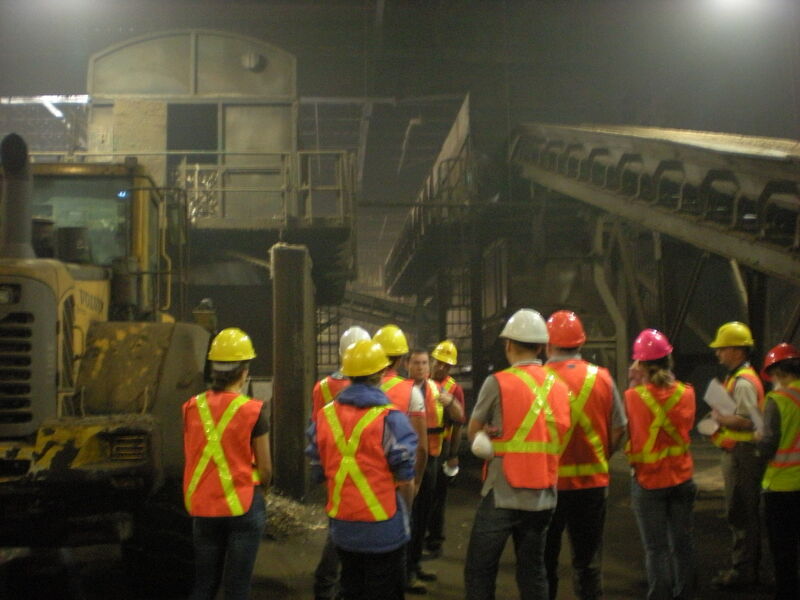 The Ottawa Valley Chapter of the Air and Waste Management Association’s (A&WMA) next breakfast seminar is set to take place at the Metropolitain Brasserie on Tuesday, December 14, 2010 at 7:30 a.m. Guest speaker Dr. Jennifer Decker from the National Research Council, will present “Measurement, Standards and Nanotechnology”. There will be a full breakfast buffet and formal presentation, Q&A period and as usual, time to network! Please see the invitation, available here, for further details. Immediately following the breakfast seminar at 9:00 am the Ottawa Valley Chapter will be holding their Annual General Meeting. All A&WMA members are encouraged to attend and non-members are welcome to stay to learn more about the chapter. All members are eligible to vote for and stand for positions on the board of directors. Admission: Students pay $10 if they are members or $15 if they are non-members. AWMA Breakfast Seminar this Wednesday! 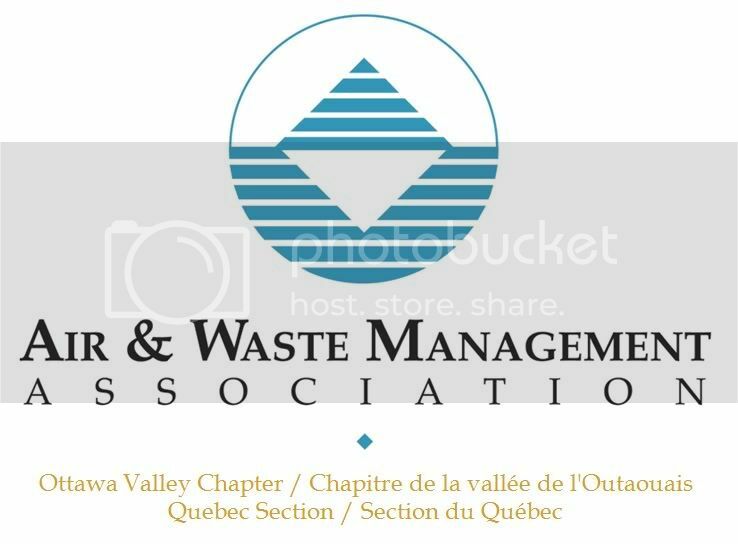 Don’t forget about that the Ottawa Valley Chapter of the Air and Waste Management Association (A&WMA) is holding a breakfast seminar at the Courtyard Restaurant (21 George St.) THIS Wednesday (Nov 3) at 7:30 a.m. The speaker is Carleton’s own Dr. Amir Hakami, who will present “Using Air Quality Models as Decision Support Tools“. There will be a full breakfast buffet, a formal presentation followed by a Q&A period and as usual, opportunity to network. Please see this invitation for further details. Admission is $10 for AWMA student members and $15 for student non-members. Please register at at http://www.awma-ovc.ca/ (click the on-line registration link for the event). Payment can be done online by VISA or Master Card or at the door by VISA, Master Card, cash or cheque. For more information on how to join the AWMA student chapter, click here.